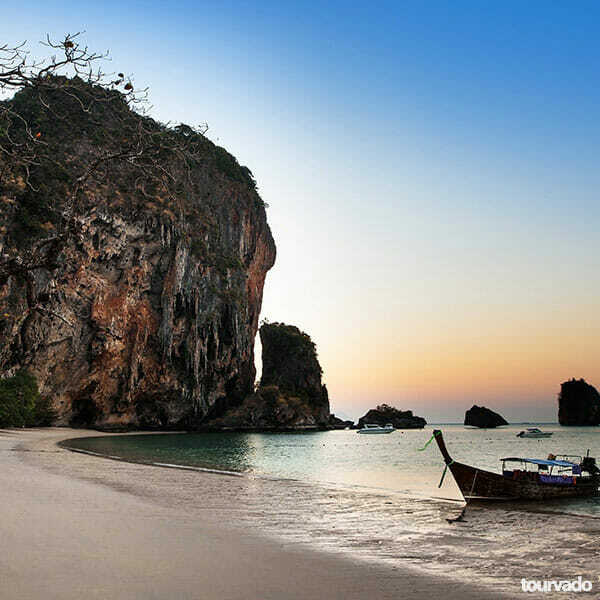 7 Island Tour Krabi by Longtail Boat begins in the early morning after your hotel pick up to set off by a large long tail boat for the incredible and famous Tup Island, this island is big trend on socials too. You will arrive around 9.30 am here then you can relax, snorkel or sunbath nearby the gorgeous waters. It is also your free time to go explore as you wish this sensational island. 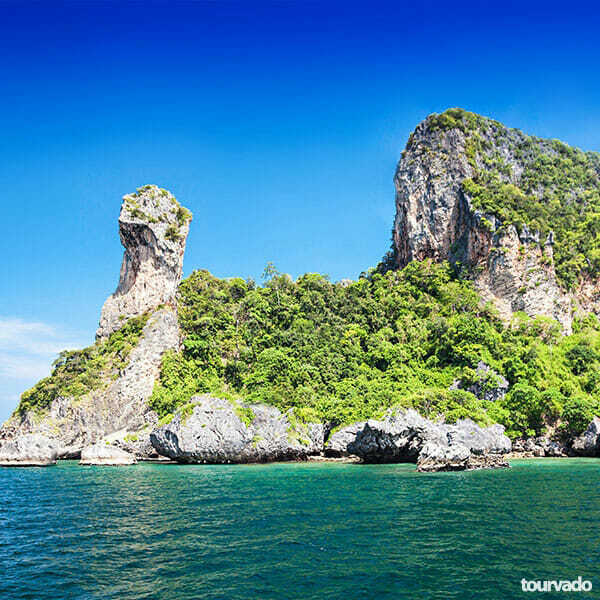 Swimming and sightseeing and relax all continue at Chicken Island, so named after its unusual rock formation that resembles a chicken head and protrudes from the very top of the island’s craggy cliffs. Well … another internet sensation actually, though we won’t go ashore you will have your time to take opportunity for great photos and do some snorkeling as well. If you really feel like indulging your adventurous side than how about testing your metal in climbing skills with Deep Water Solo and cliff jumping! Just let our guides show you how to do it and climb some of Krabi’s best formations. Gather your wits and let’s leap from the top! (Sometimes not possible in low season due to rough seas). This are definitely some spaces with an incredible view so you will be taken on a picturesque tour to see all the beauty of the surrounding limestone cliffs. 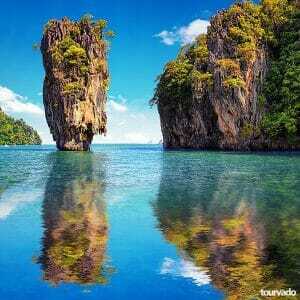 Phra Nang beach is undoubtedly the best place to take pictures of the bizarre rock formations in South Thailand’s. Not to mention the beauty of the beach itself! We can freely explore the caves around this area, take a dip jump and swim in the crystal waters. Remember not to miss the fertility temples found inside two of the larger caves! Next to visit is of course Si island which always tends to be the fans favorite on this trip. Is has by far the smallest beach on the tour, but when we find low tide it can transform into a large sand bar which really extends for kilometers, so we suggest you take your time to explore and enjoy! 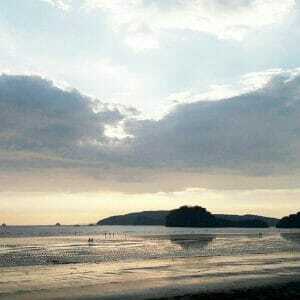 After the last two stops, Tang Ming Island your perfect place for some good rest and relaxation. Get ready also here by the way to see many fishes and corals with your snorkel gear. Poda Island also makes up for in beautiful white sand and scenery. 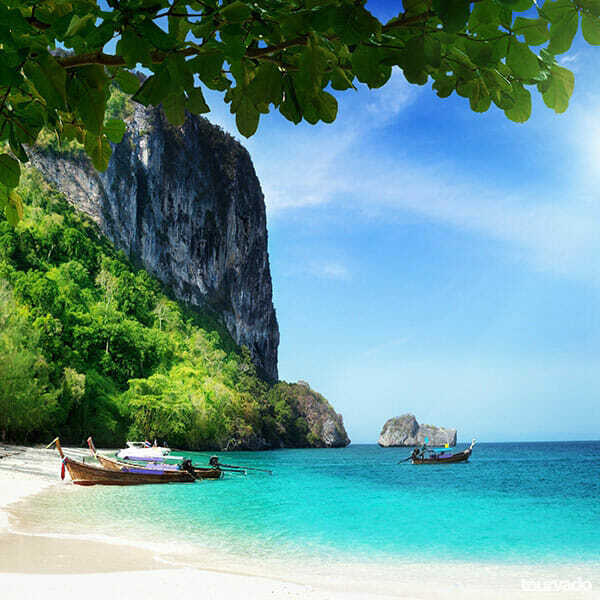 It is a great place to witness all the beauty of the Andaman Sea! It is a truly beautiful island! Here you can walk around on the white sand for about 1km but also go into the middle of the island where there are trees and surely wildlife to explore. We also get to the time to taste Thai lunch with a buffet at beach restaurant at Railay beach. The meals to choose from are, bbq fish and chicken, Chicken Massaman, Fried rice, vegetables in oyster sauce, fruit and water. You can eat and eat and feel the gentle breeze and the sun and the waves and the sales of every little boat as at 6.00pm we will carry you at home back to the Pier and to your Hotel. 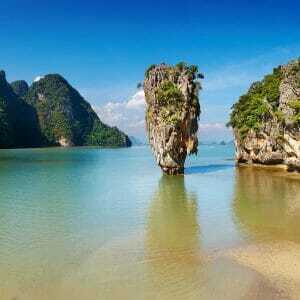 7 Island Tour Krabi. 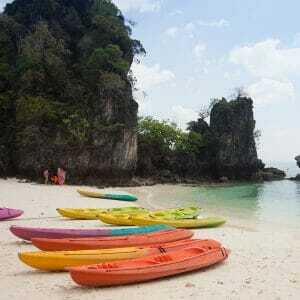 Departure with pick up from your Hotel about 8.00am to 8.30am, 7 Island Tour Krabi by Longtail Boat is full day trip. Discover with us all the Seven most beautiful and visited islands near Krabi with very nice long tail boat and very gentle staff. We will bring you to sightseeing this wonderful islands including a nice and delicious buffet in unforgettable location. This trip is highly recommended to get a true view of Thailand nature and shoot amazing pictures, it is really a typical long tail boat tour not to be missed. 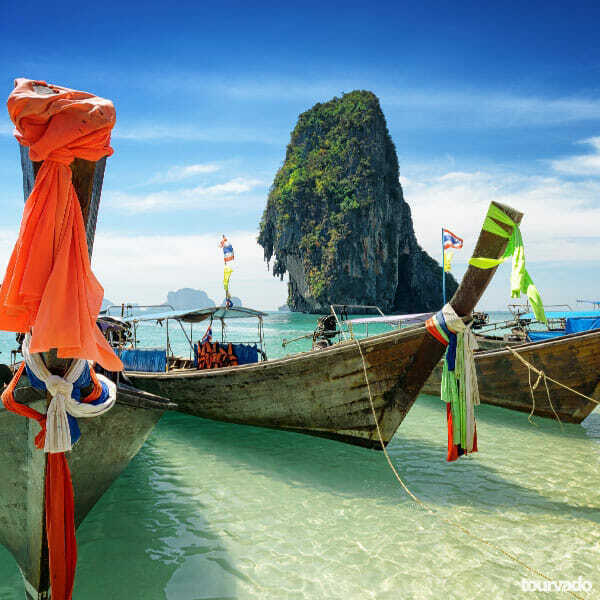 This 7 island Krabi tour runs everyday. 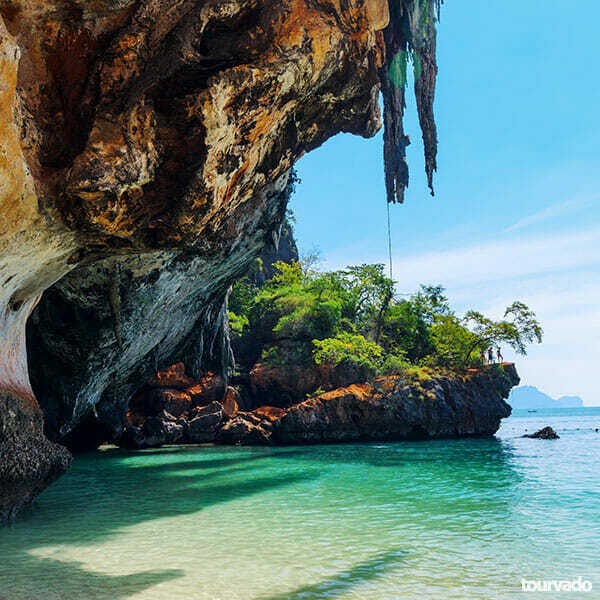 It goes on visiting all the greatest 7 Islands to give you an amazing experience and a fantastic overlook on this landscapes which includes Tup Island, Poda Island, Chicken Island, Sii Island, deep water solo and Thang Ming island and Phra Nang island and cave. The tour finishes at 6pm. The National Park fee is not included in the tour price and has to be paid on the spot to by the guests to our guide ( 400 THB per adult – 200 THB per child)! For this tour the National Park fee has to be paid on the spot in cash and are not included in the tour price ( 400 Thai Baht per Adult and 200 Thai Baht per Child)! For this tour the National Park fee has to be paid on the spot and are not included in the tour price ( 400 Thai Baht per Adult and 200 Thai Baht per Child)!